Terrified residents braced for bloody battles in Tripoli on Saturday after a night of gunfire as Muamer Gaddafi said he was ready to arm civilian supporters to defeat a popular revolt. US President Barack Obama imposed sanctions on the Libyan leader and four of his sons, in a clear attempt to weaken his teetering regime and punish his brutal crackdown on the most serious threat to his four-decade rule. 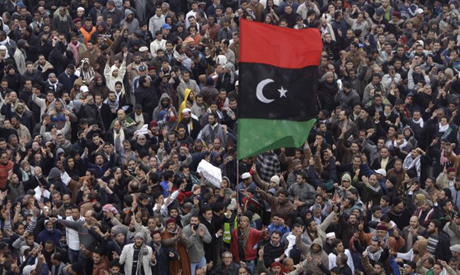 The escalating revolt to overthrow Gaddafi, which his deputy envoy to the United Nations said has killed thousands, emboldened tens of thousands of protesters across the Arab world to step up demands for historic reforms. After massive protests in Tunisia and Egypt forced the resignations of longtime leaders Zine El Abidine Ben Ali and Hosni Mubarak, Libya's ruler of four decades appeared to dig in for a bitter fight to the end. Libya's ambassador to the United Nations, a childhood friend of Gaddafi, became the latest official to defect as regime loyalists opened fire in shootings that spread through Tripoli, killing several unarmed civilians. "Please, the United Nations, save Libya," Mohammed Shalgham told the Security Council in an emotional speech, in which he raised the spectre of Hitler, Stalin and Pol Pot. His intervention helped to jolt the UN Security Council into ordering a special session Saturday to consider a sanctions resolution against Gaddafi, on top of those ordered from the White House and by the European Union. "After Shalgham's speech yesterday, people shouted with joy, the mood was very good. But just a few minutes after his speech, the electricity was cut and it hasn't come back since," one Tripoli resident told AFP by telephone. "We were terrified. We thought that meant they were preparing for attacks. We grabbed whatever we could use as weapons and stayed by the door in case anyone broke in," the resident said. "We could still hear gunfire all night." Security forces opened fire indiscriminately on worshippers leaving prayers in the Libyan capital on Friday, witnesses said. They said several people were killed in eastern suburbs where security forces had opened fire on previous days, but sustained gunfire was also reported in the western district of Ghut Ashaal. Foreign governments have scrambled to evacuate thousands of expatriates who told of scenes of hell in the oil-rich North African country since the crisis broke out 12 days ago. A British Royal Navy frigate with 207 evacuees from more than 20 countries docked in Malta from the rebel-held Libyan port of Benghazi on Saturday after a 35-hour Mediterranean crossing through rough seas. Gaddafi, the army colonel who grabbed power in 1969, appears determined to dig in for a bitter fight to the end, after protests in Tunisia and Egypt forced out Ben Ali and Mubarak. In a brief but chilling address that presaged a bloody battle for the capital, he told frenzied supporters in Tripoli's Green Square on Friday that the rebels would be defeated. "We will fight them and we will beat them," he told a crowd of hundreds. "Sing, dance and prepare yourselves," the 68-year-old leader said. "If needs be, we will open all the arsenals." Almost the entire east of Libya has slipped from Gaddafi's control since the popular uprising began in the port city of Benghazi on February 15, inspired by the revolutions in neighbouring Egypt and Tunisia. Libya's deputy UN ambassador, Ibrahim Dabbashi, said he expected more people to be killed and warned that Gaddafi is "psychologically unstable," saying he had the choice between being killed or committing suicide. Obama issued an executive order, seizing assets and blocking any property in the United States belonging to Gaddafi or his four sons, saying the measures were not targeting the wealth of the Libyan people themselves. "The Libyan government’s continued violation of human rights, brutalisation of its people and outrageous threats have rightly drawn the strong and broad condemnation of the international community," Obama said. UN chief Ban Ki-moon has demanded decisive action by the Security Council, warning that any delay would add to the growing death toll which he said came to more than 1,000. Britain, France, Germany and the United States have drawn up a resolution which says the attacks on civilians could amount to crimes against humanity. It calls for an arms embargo and a travel ban and assets freeze against Gaddafi and his entourage. The European Union has also agreed to an arms embargo, asset freezes and travel bans on Libya. Gaddafi made three public statements this week, calling on his followers to crush the insurrection and said Al-Qaeda was behind "drug-crazed mobs" of young people trying to unseat him.